For those of you interested in the cosmological aspects of the many Ancient Temples around the world, this a must see documentary. Recent technological advances show several theories that suggest there was a ‘great plan’ according to ‘ancient belief’, linking the pyramids of Giza, Easter Island and the Temples of Angkor. Our starting point in time is the dawn of the Spring Equinox in the year of 10,500 BC. The alignment of the stars of the Constellation of Draco of that morning are mirrored exactly by the layout and positioning of the Temples of Angkor, built some 11,000 years later. 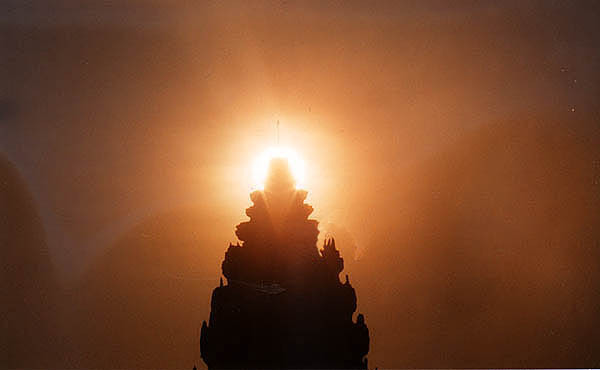 Even if one disputes the computer and satellite evidence, it cannot be denied that Angkor Wat lays at exactly 72 degrees east of the pyramids of Giza in Egypt and 72 degrees west of Easter Island in the Pacific Ocean. We now know that the pyramids were built to catch the light of the stars on special dates and they were laid out to mirror the constellations. All these precise calculations were done in order to bring “Heaven and Earth ‘closer’ together for the benefit of the people”, according to ancient Egyptian writings. So if that is the case in Giza, why not in Angkor? Another is the number ‘72’. It is a primary number in a sequence of numbers, which are very much linked to the constellations over a period of 25,920 years. They show the Earth’s axial procession to vary by one degree every 72 years. The importance of this number is demonstrated to us by the Khmers at the Bakeng Temple, where there are 108 towers surrounding it. 72 divided by 2 equals 36 and 36 +72=108! So again, the importance of the primary number of 72 is shown to us. Also, the number 72 features throughout in the construction of the pyramids of Giza. Just how this knowledge was shared with the Khmers in the building of their empire some 11,000 years later is not known, but clearly it was!